This brings us to the question of just what things will give away a false deal. Initially I planned on covering the subject of detecting a false deal at the end, but I have since decided that if you know what things to watch for it will help to improve the quality of your false deals. From the beginning it is important to realize that there is no one thing to watch for, meaning that, false deals do not look a certain way or sound a certain way while real deals look and sound another way. There is no real consistency from one method to another and from one performer to another. One of two things may occur in cases such as this, the first and I find it to be the most natural, is for the later grip to remain. 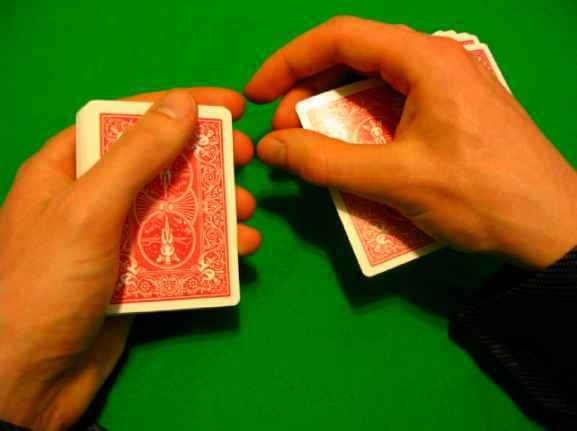 In other words, after making the shift from the grip in figure 353, to the grip in figure 354, the dealer would continue using the grip shown in figure 354 for the remainder of the cards. (Just in case I have inadvertently created some confusion, the grips shown are not the only possibilities, virtually any shift could occur, the photographs merely illustrate how a subtle change may occur quite easily.) 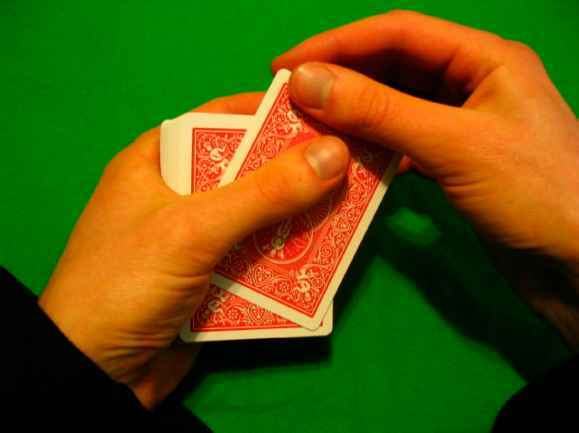 The second possibility is that the dealer will shift to a particular grip and then back. If this is the case you should watch to see if the shift is consistent. 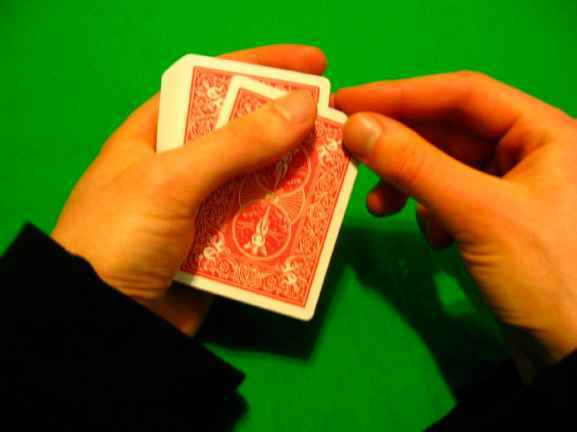 For example, each time the dealer reaches the fourth player his grip changes, then for the fifth or sixth player the grip changes back. This would be a fairly obvious tip off. Another possibility, and something you as a dealer should attempt to avoid is using different grips depending on what deal is to be performed. For example, on one particular round the dealer may not be cheating and thus use a grip like that shown in figure 353, but on the next round may wish to bottom deal and thus shift to a grip such as that shown in figure 354. A further shift may occur if he desires to perform a second deal or a Greek deal etc. Caution must be exercised on this point since it is possible to perform false deals from a variety of grips and a different grip doesn't necessarily indicate anything. For example, I personally like to shift from one grip to another on different occasions to maintain my edge with each grip and each method and I have numerous methods I can use to perform most or all of my false deals from the same grip. 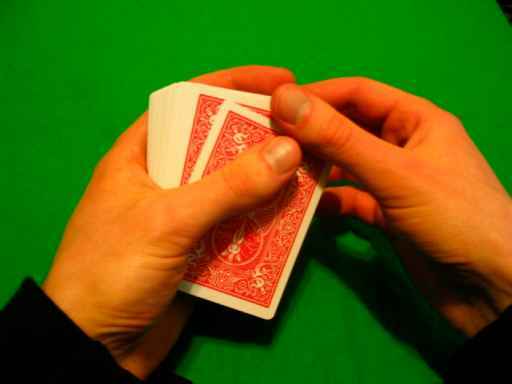 The next tip off is the position of the dealer's right hand fingers on the card after performing the take. While variation can occur here, there should be general consistency. 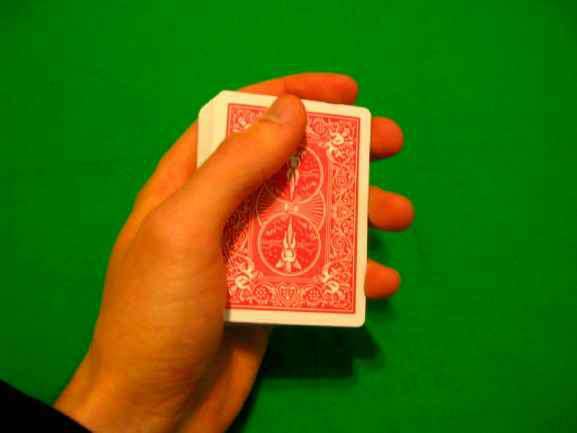 Again, watching for consistency in exactly when this grip on the card changes is important. 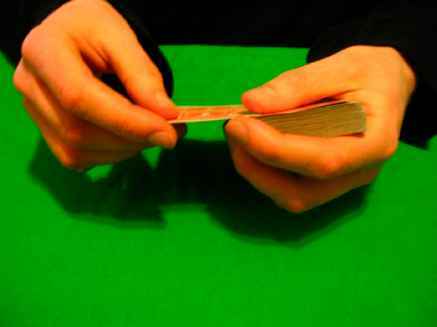 For example, if the dealer is dealing cards for five players and the cards dealt to the fourth player are consistently different from the other four players then you likely have a case where false dealing is occurring. 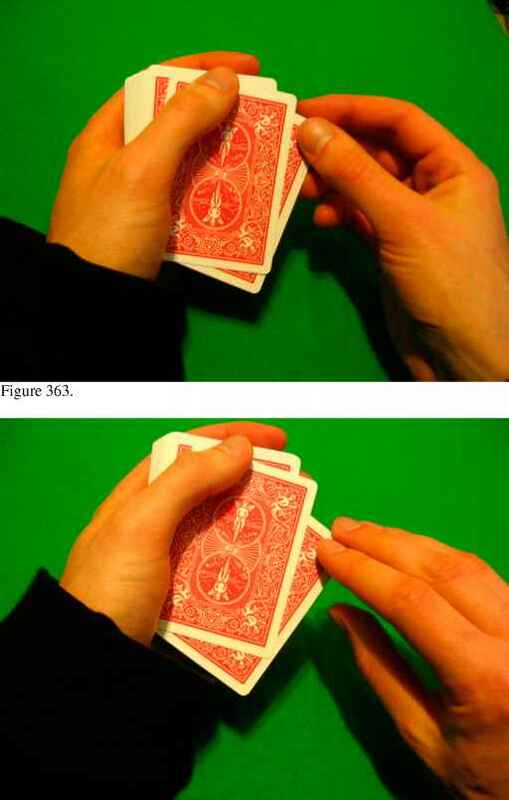 (See figure 355 and figure 356 for examples of subtle differences in the finger position). Again, this is an inconsistency to watch for, though it isn't likely to occur often. Now naturally this may vary considerably depending on the deal, so I will examine these accordingly later, but it is a point to be aware of. Another issue, common to the likes of a push-off second deal is that the take will be performed with a different finger than it should be. 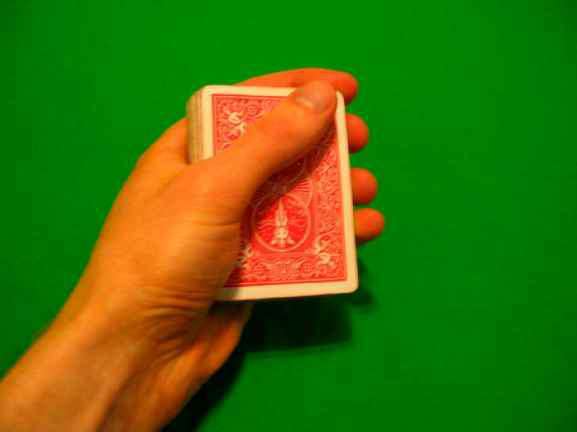 The common approach, is to perform the take on the bottom of the card with the middle or ring finger rather than from the top with the thumb. This is a very subtle difference and difficult to detect, though also difficult to disguise. A different sort of motion characterizes it, namely the take it performed outward instead of downward. I must stress at this point how there is no correct way or assured point to examine, what you are paying attention for are inconsistencies. I will elaborate later on specific tip offs when it comes to the take and a specific deal, but as always, the issue is simply to watch for inconsistencies and to avoid them yourself. You will notice that the corner of the top card in the first photograph is flashing, specific details such as this will be covered later. Next, there is the issue of thumb movement, most notably for second deals. If you notice the thumb is moving for some deals and not others, that is a problem. You may also notice that the timing of the movement changes. 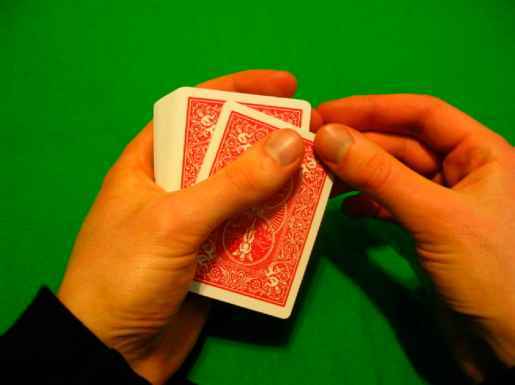 For example, when performing a push-off second, the pullback of the top card may occur sooner than the pullback would occur on a legitimate deal. 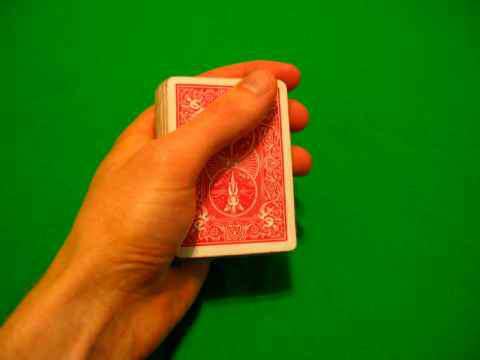 Finally, the thumb movement may be inconsistent on the vertical plane, to illustrate this disparity, try pushing off two cards and then sliding the top one back. 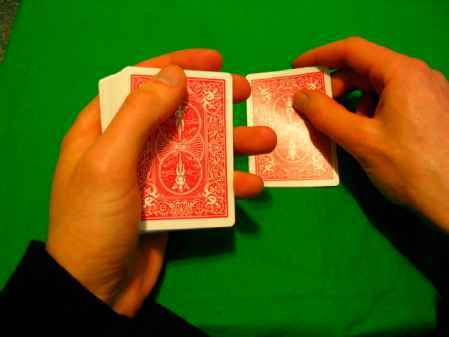 Now simply try pushing off the top card and dealing it off and watch the difference in the thumb. 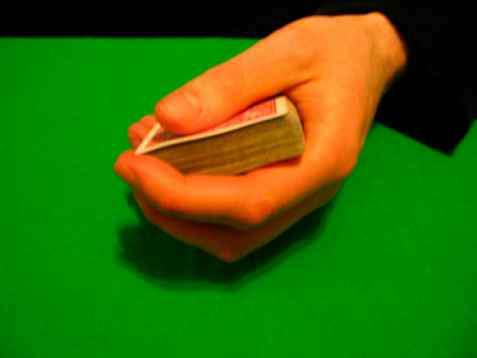 The tendency is to lift the thumb off the deck when performing the real deal and to allow it to slide across the top of the deck on the false deal; naturally, this difference in procedure provides a tip-off that something is amiss. 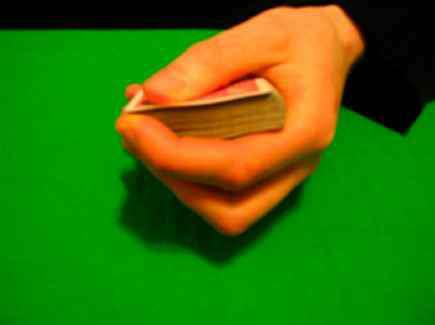 Naturally, the finger flash will vary depending on the deal and the grip, but this provides you with a general indication of what may occur and what to watch for. You will find I think that the last tip off is the most difficult to avoid by far, namely sound. 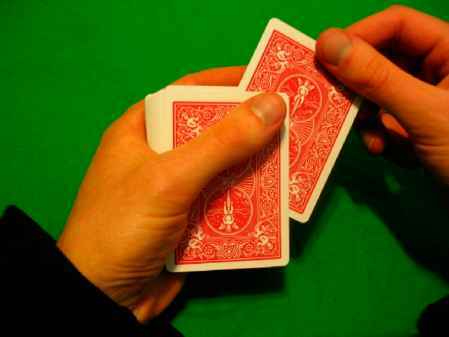 For various reasons, different deals will cause the cards to talk (make noise) and do so in different and inconsistent manners. This occurs to such an extent that one can often close their eyes and detect a false deal merely by sound. Again, there is no particular sound to listen for, the tip-off comes when a particular deal sounds different, this is especially true when it is consistently different. 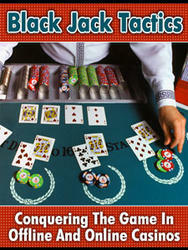 For example, if the cards dealt to the fourth player in a game consistently sounds different. 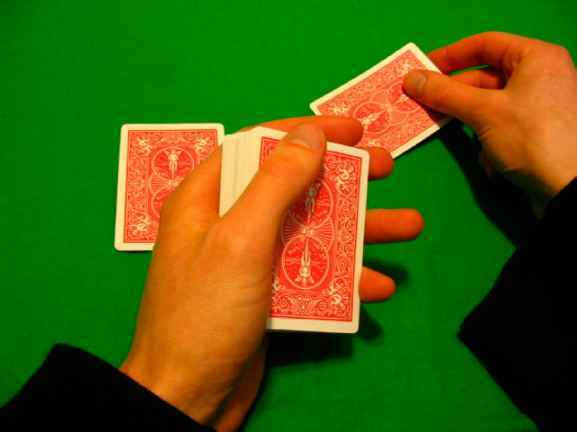 Naturally, if the false deal is terrible you will be able to see that the card isn't coming off the top of the deck, but this is a tip-off that cannot be relied upon. 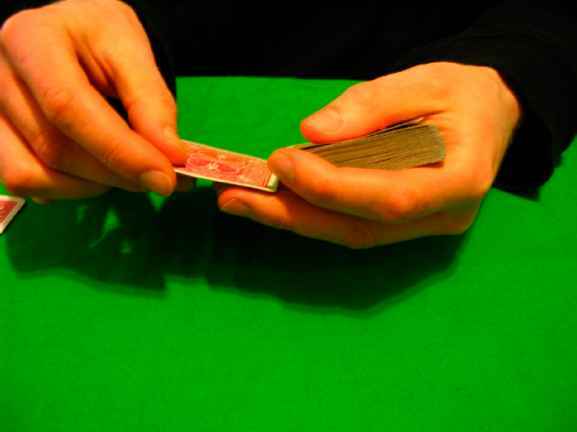 Ideally, you will be able to fix your eyes on the top card and ensure that it is in fact dealt from the top of the deck, as almost no one's deal is good enough to avoid this tip-off. The problem is that most of the time you are unable to see the top of the deck and thus this method is not effective. Ultimately, there is also the issue of telegraphing to consider. 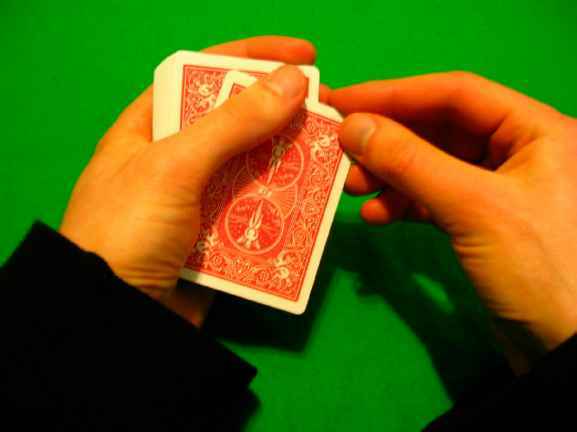 Telegraphing is not the same as a tip-off since it doesn't refer to technique, but rather to mannerisms of the dealer in question. Someone who is cheating may appear nervous, give extra attention to a particular action, create unnatural breaks in procedure etc. You should be avoiding such indications yourself and watching for them yourself.